Kilimanjaro is the highest mountain in Africa, standing at 5,895 metres above sea level. It is situated in Tanzania, close to the border with Kenya. Is is a dormant volcano with its three volcanic cones, Kibo, Mawenzi, and Shira. The highest being Kibo. A large number of customers who join our trek training walks are preparing for a trek on one of the many routes up Kilimanjaro. The time taken for an ascent and descent varies between five and nine days, depending upon the route chosen. If you are still considering which route to do, our recommendation would be to choose one of the longer ones that allows the body more time to acclimatise to altitude, such as the Shira Route or Lemosho Route. We also recommend that you book through a reputable and ethical company, and don't necessarily go for the cheapest. I am in my mid 50’s and started to join the trek training walks with Cath at Peak Walking Adventures around the end of 2016, with the aim of maintaining my fitness level. I was also was looking for my next challenge at the time. I found Peak Walking Adventures from searching internet. I am a regular walker in the Peak District, and I found that the walks offered by Cath are of particular benefit to me because of their carefully designed routes, and pace of the walks. In addition, I was able to benefit from advice and reassurance. 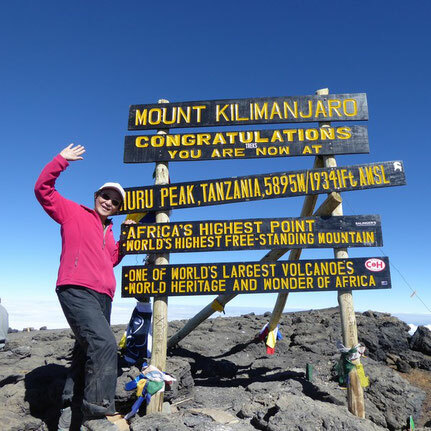 Through talking to other like-minded people on Cath's walks, who were keen to share their experiences, I became aware of the many overseas treks available. I grew more confident about tackling something like that, as I saw myself as being at a similar fitness level to them. Based on this, and inspired by what I had heard, I made the decision to do Kilimanjaro last August. It was harder than anything I did before but really rewarding. With the added-on safari it was a dream come true. Hire your sleeping bag and mattress from the company that you book through. That way, they will not use space in your overnight bag and not be counted in the bag weight limit. During the trek, drink plenty of hot water/tea/coffee to avoid stomach problems. Take a good amount of cash, particularly small notes for tips. There are no cash points on the trek or during the safari trip, and a long processing time at the local bank. High energy bars are useful as food supplements. Take medication for a sore throat with you. Four or five people out of the twelve on my trek suffered from a sore throat due to the dry and dusty path.